*Click the PURCHASE TICKETS HERE button to the right to see the menu and place your order. Let the Cartel help bring your family to the table this Holiday Season! Pick up will be on Saturday (12/23) from 8:00AM to 11:00AM in front of the historic Columbia Theatre. Let us smoke your meat. But before that, let’s celebrate! 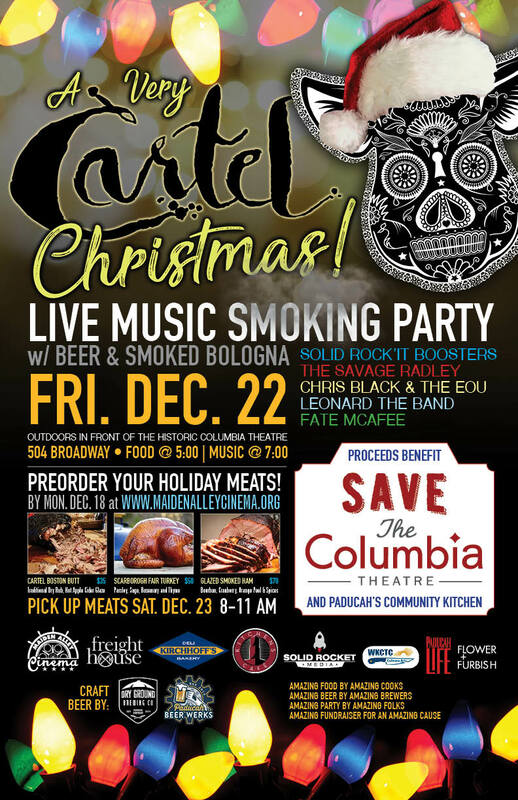 The Cartel invites you to join them ON Broadway in front of the historic Columbia Theatre on Friday (12/22). Enjoy live music from The Savage Radley, Chris Black & the EOU, Leonard the Band, Fate McAfee and the Solid Rock’it Boosters for FREE!!! See the Cartel in their natural environment. Cartel crafted soup and sandwich options will be available for purchase beginning at 5:00PM. Paducah Beer Werks and Dry Ground Brewing Company will start pouring at 7:00PM. All proceeds benefit the Columbia Theatre Restoration. If you are interested in volunteering please send an e-mail to volunteer@maidenalleycinema.org.